We ran a story about Nick Barrucci appears on the Shopping Channel for Dynamic Forces and having their exclusive copies of Action Comics #1000. And then we told you about it not happening because of snow storms. The rescheduled program airs tonight at Midnight EST / 9 PM PST. For Action Comics #1000 they have renowned Superman writer and illustrator Dan Jurgens — who has drawn AND signed the DF Exclusive Cover. Also a featured item is the Dynamic Forces Exclusive Variant Wrap Around Cover in color and pure line art black and white editions. Also included is a Classic Pencil Sketch Variant Cover from the longest running Superman artist, Curt Swan. 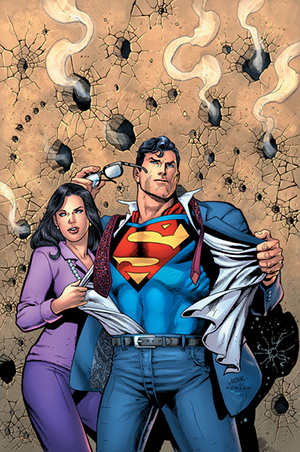 Additionally, the show will feature a special selection package of Eleven Action 1000 Variant Covers depicting the Man of Steel throughout the decades; from his inception in 1930 through present time with classic artists, Dan Jurgens, Jim Steranko, Dave Gibbons, Joshua Middleton, Steve Rude, Michael Allred, Lee Bermejo, Michael Cho and Jim Lee. These covers are sold out at the distributor level and through many retailers across the country, and DF is bringing first prints to air!!!!!!! And to go with Marvel’s Avengers: Infinity War — the show will feature a selection of commemorative comic book issues from historic Marvel and Avengers comics that have led to concepts and ideas used in the Avengers: Infinity War movie. Dynamic Forces features a collection of rare Avengers themed Variant Comic Book Covers along with original Sketch Art Covers featuring Thanos and a who’s-who of popular Avengers characters including Black Panther, Iron Man, Captain America, Falcon, Thor, Spider-Man and the villainous Thanos. All of these collections are signed in black and gold ink by prominent industry creators including Alex Ross, Jonathan Hickman, Adam Cleveland, Brian Kong, Joe Del Beato and Mariano Nicieza. I can’t express how excited I am to bring so many great comic collectibles to The Shopping Channel — introducing Action Comics #1000, a truly landmark issue of the longest running Superhero Comic of all time, to The Shopping Channel fans! This is a great issue that I feel those who pick it up will appreciate how many wonderful creative teams came together to produce this masterpiece, and we have it signed by a name very closely associated with the Man of Steel – Dan Jurgens! To add to that, we have Metal #1’s – DC’s best-selling event series – signed by Scott Snyder and Greg Capullo! And to have more Avengers and Infinity tie-ins to the show with signatures of such luminaries as Jonathan Hickman and Alex Ross helps create a very well rounded show. I’ve said this before, and believe it strongly, the ability to appear on air to bring these great comics to a large audience helps grow the industry one reader at a time. It’s the best feeling in the world! Additional selected signed comics featured on the show are Metal #1 Variant Cover with Gradient Art with two signatures by Scott Snyder and Greg Capullo. Also, the world premier of the classic 1980’s Marvel 25th Anniversary Issue – Spider-Man Marvel Tales #190 signed by iconic artist John Romita. All Comic Books to premiere at the TSC Dynamic Forces Show beginning tonight at 12 Midnight/ 9PM PST.